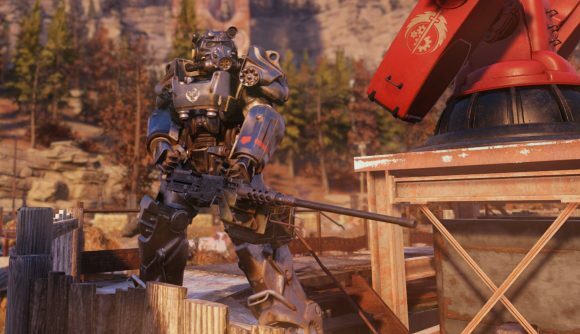 There’ve been hints that the Brotherhood of Steel would appear in Fallout 76 since the E3 trailers, and a recently-uncovered note in the upcoming game has confirmed that the organization was in West Virginia circa 2102. That’s contrary to how most fans had interpreted existing lore up until now, but Bethesda’s got an explanation. Sort of. According to existing lore the Brotherhood was founded in 2077 in the immediate aftermath of the nuclear war which wiped out civilization. As far as the Fallout story so far has gone, they had been locked up in a California military shelter since then. Apparently that’s not the case, and the sudden confirmation that the Brotherhood was operating in this part of the timeline had some lore purists reeling, as Eurogamer noted last week. Lore is always subject to change based on the needs of the latest story, and the tweet explains things well enough – though there’s still at least one sticking point. The logo shows the larger gear on the right side of the sword, which indicates that this is specifically the East Coast chapter of the Brotherhood – the one depicted in Fallout 3. This part of the organization gets founded in 2254, over 150 years after Fallout 76 takes place. I’m sure some kind of clever explanation will cover that bit, too – and it’s pointing multiple directions in that image anyway, so who knows. The Fallout 76 release date is closing in, so we’ll be able to solve these wasteland mysteries for ourselves soon enough. One thing’s for sure – these wikis I’ve been reading for the past six months will need some addendums.